AP govt to introduce biometric system in schools: AP State Biometric Attendance System introduced soon in Government Schools. AP Biometric System will be implemented in all schools. AP Teachers and Students should enrolled in the Biometric Attendance Register. The State government is going to implement biometric system in the government schools from the coming academic year (2016-17). It is being said that the government has been mooting implementation of the system for long and decided it as a perfect way to curb the alleged irregularities in the mid-day meal scheme. As of now biometric system is being implemented in various government departments and the top brass of the education department felt the need to implement the system to also monitor the strength of the students besides attendance of teachers. In a bid to curb the irregularities in the mid-day meals scheme, the government directed DEO, project officer of Sarva Siksha Abhiyan and head masters of the schools to compile details like Student’s date of birth, his father’s name and the social status. The same would be computerised and link to the central server. Experts state that this system would help to check the misuse of funds as it can be checked against the biometric system to verify strength on any given day. Biometric technology offers advanced verification for employees in every industry or Institution. Because biometric systems identify people through physical measurements of unique human characteristics or behavior, they thwart attempts of time fraud, where one employee punches for another. Biometric systems do not require easily-lost or stolen badges, or other identifying objects. Employee attendance verification is a major use of biometrics today. Biometrics is the science of characteristics that are unique to each individual such as fingerprints or irises. Biometrics is often used by governments, companies, banks etc. This system alsocountemployees and students, it is to ensure the accuracy of attendance. This Biometric attendance system for managing time and attendance of employees and students. With the help of this send attendance SMS to officials that whether is Absence or Presence or Parents can also can receive SMS of their children Arrival and Departure from home. Andhra Pradesh state is implementing a new policy for Properly functioning government schools and Teachers and students are properly attended to the government schools. The government has taken tough decisions to strengthening of Education System and Schools, While to give the quality education to the poor people. In this part the Andhra Pradesh State government has decided to introduce biometric attendance system in all the school, colleges and hostels to rightly monitor the attendance of students and Teachers and bring in more accountability and discipline in the state run institutions.So, Teachers and students attend to schools in time and enrolled in the biometric register. The department officials has prepared for setting up in all schools. The government is of the opinion that the bio metric system will help it monitor the attendance at schools. The government can pay salaries to teachers and scholarships to students based on the attendance recorded. As per the government's plan, the biometric attendance system will replace the manual signing of attendance in government schools. Once it is in place, teachers will have to spend at least six hours teaching in schools, a rule which is being rampantly violated. With the some reasons, the government has decided to introduce bio metric attendance system, this decision is meant to bring in accountability in teaching practices in the state owned schools. But it has now become another bone of contention between teaching community and the state. Officials of Secondary Education Department feel that it is only way to monitor a section of teachers have other business interests other than taking classes. 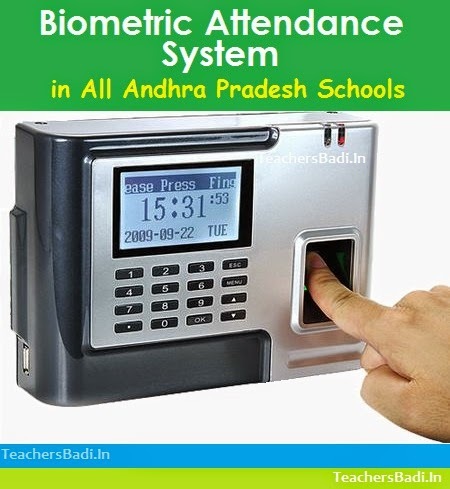 Biometric Attendance System introduced soon in AP State Government Schools:While the system will help improve retention rate and thus check the drop out ratio in schools, it will control unauthorised absenteeism of teachers, which will improve the education quality. The biometric attendance system will also help the proper implementation of other incentive schemes. It will help check stealing, often done by expanding the attendance, in the implementation of the MDM scheme in schools. Similar is the case for free text books and school uniform distribution.